On the afternoon of that ominous day, I am driving along a prefectural road in Kamakura. The moment I feel the tremor, I assume it is my beat-up old engine acting up, again, for the millionth time. I look out at the road stretched ahead. It is hard to believe what I am seeing. The asphalt is churning like waves for hundreds of meters. Immediately I look up with dread toward the Shonan Monorail pillars and thick rails, and they, too, are undulating along with the road. Then, the two green traffic lights up ahead go out – one, then the other. I calm my nerves, park the car in an open area, and listen intently to the radio. It is interrupted by an announcement that there has been a major earthquake in the northeast. In Tohoku…?! Feeling a tremor like I have never experienced before, several hundred kilometers away here in Kanagawa, I have no doubt the magnitude of this earthquake is on the same scale as that of the Great Hanshin Earthquake. By evening, I have stopped by my parents’ place to check that they are alright in the blackout, and have jumped back into the car headed for work. Late at night, I am in my hotel room glued to the TV. Every few minutes I can hear earthquake alarms going off. Occasionally a pillar creaks and the lights sway. 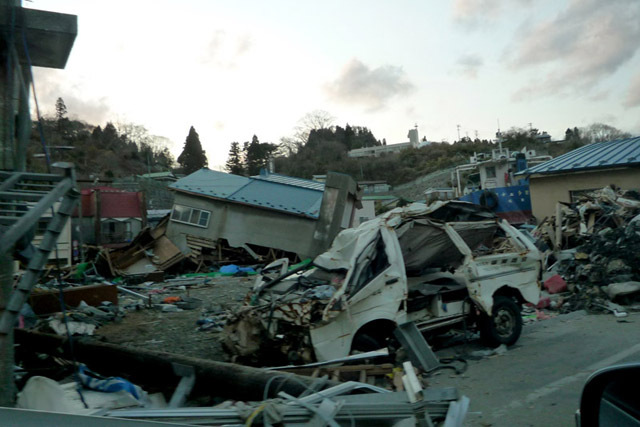 At dawn, a 6.7-magnitude earthquake hits the Shin’etsu region. I am in bed with my eyes closed, but I cannot sleep. A few days later I find out about the nuclear plants. Midday news coverage of the nuclear plant roof is chaos. “Just get a grip on the real information” is what I am thinking to myself as I try to resist succumbing to sensationalism. Yes, I must be cautious about accepting any kind of news at face value. The next day, and the next day… shocking information and scenes of the coastal areas are flooding the TV screen. Helicopter buckets release water to fight the fires, but the winds disperse it into mere mist above the nuclear reactor. Each day the number of missing persons doubles, and soon the number is exceeding 10,000. It has been six years since I was in that mental state. When I think back upon that time, strangely, everything before that feels more recent. Prior to the earthquake, I have had one experience involving a fire. There was a suspicious fire nearby, but I felt immune to any dangers. I ended up losing memories, property and many other things. Today I survive in perfect health, but the actions I took on that fateful day clearly impacted my presence here on Earth. That is why, as I follow the news on TV and in the papers, I think about all of the people living in the evacuation shelters, struggling to cope with pain and suffering that is undoubtedly and incomparably harder than what I had experienced with the fire. Work and daily life in the days following the earthquake feel as though they are worlds away, and I cannot not seem to concentrate on anything other than the aftermath. Thinking back, right after the disaster, or maybe throughout the whole of 2011, the questions, “What can I do?” and “What should I do?” constantly occupied a portion of my mind, and whether I was at work or just going about daily life, I always seemed to be in my head. Pretty soon, the media is spreading the understanding that people should not head to the disaster areas without proper preparations or plans. Every morning I wake up with the desire to just pack my car with food and daily necessities, and find some back roads that can take me to the disaster areas. However, I worry that if I were to accidentally cause some kind of trouble or inconvenience anybody in anyway, it would be defeating the purpose. And working in the fringes of media myself, any trouble I caused would cause problems for so many others. That is why I have been drafting my own strategy for the whole of March, and simulating a “Relief Aid with 0% Inconvenience”. My intentions are to initiate my plans on April 1 and set off on my own to the Tohoku region. I have yet to find out whether my intentions were beneficial or not. By April 1, a fair degree of food supplies have been distributed and, although minimal, infrastructure opening up access to the evacuation centers have been developed, so the timing seems pretty good for anybody intending to visit the Tohoku region without becoming a burden to the relief effort or others. SNS gives me some insight into the plight of those who have remained in their homes, or have located to small evacuation centers where the delivery of needed supplies has proven problematic. Daily necessities, food products, amenities and other items that have taken on the status of luxury items… I packed as much of them as I can in big travel bags and board a plane to Aomori and Misawa. 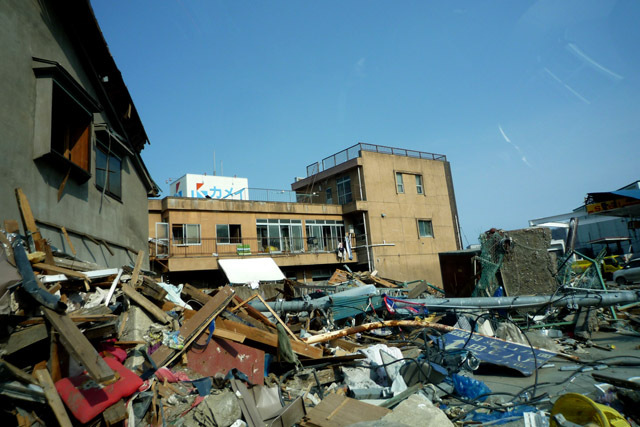 Although Misawa and Hachinohe have seen their own share of damage, compared to the Iwate, Miyagi and Fukushima coastlines, the towns are slowly catching up on life as usual. An oil tanker has made its way to Hachinohe, replenishing the lack of gasoline and availability of rental cars. So, off I go to the section of town that has suffered the most damage. In Hachinohe, a close friend of mine owns a sake brewery, and although we frequently speak on the phone, seeing his face for the first time in a long time is an emotional moment. The brewery wall has been dealt a blow by a fishing boat. The river that has been flooded by the tsunami has, in turn, flooded the brewery and caused a great deal of damage, but fortunately it is deemed that with time, the brewery will be up and running again. With a sense of relief, I say goodbye to my friends and head toward the Hachinohe town supermarket to load the car with more supplies to take to the relief areas. The back seat and the trunk of the rental car are loaded with supplies and, early in the morning on April 2, I head south along the coast. Twenty days have passed since the earthquake. I am so dumb-stuck by the power of nature that the townscape unfolding before me is difficult to accept any of it as reality. It is completely different from what I have seen on TV. There are countless numbers of boats that have been grounded. There are railroad tracks and pillars scattered in every which direction. There is debris littering even the furthest reaches of town. No building foundations remain, so it is unclear whether any homes or livelihoods existed here at all. There is a car that has been crushed like a wad of paper that still sits atop a three-story building. Members of the Self-defense Forces have grave expressions on their faces as they cross the road carrying corpses. Over the course of this roundtrip distance of 400 km, how many times have I been at a loss for words, instead a sigh of sadness unconsciously escaping my lips? Along the way, I try stopping at evacuation centers numerous times, but I cannot seem to muster the nerve to actually step inside, greet people and offer supplies. The more I think about it, will they even be happy to accept these supplies? Will they think I have come bearing measly gifts just so I can have a look-see at their dire situation? My doubts were paralyzing me. Yesterday, I go online to check traffic information against the roads I plan to take, sometimes veering off the coastline and cutting straight through the inland to save on distance. 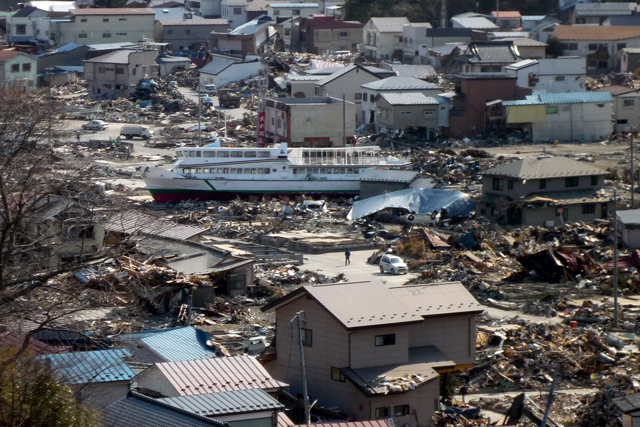 Hashikami, Kuji, Noda, Fudai, Tarō… The names of places I have never heard of prior to this catastrophic event have, unfortunately, become familiar to me through the news. One of the reasons I have come to the disaster areas via Aomori is because there are by far fewer access routes between the northern areas and Tokyo. 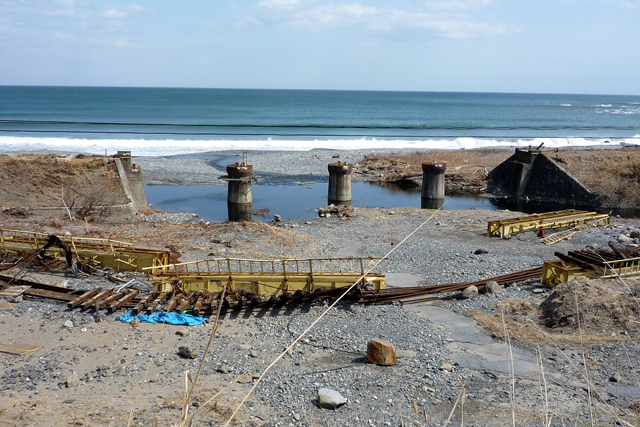 Geographically, the most difficult areas to reach from even the north and the Tohoku western coast are, as expected, Iwate’s north central areas. Before flying to Aomori, I had already decided that if I could not find an opportunity to leave supplies at an evacuation center along the way, I would just continue on to a certain town. At the time, I needed some kind of reason, some kind of “connection” to the place where I would deliver supplies. That was because everywhere was in need. The town I had in mind was a place where I knew no one, a place I had never visited, but where the brewery of one of my favorite sakes was located. I leave Hachinohe in the morning and eventually arrive at Miyako just before the sun begins to set. The scene looks exactly like Tarō and Noda. 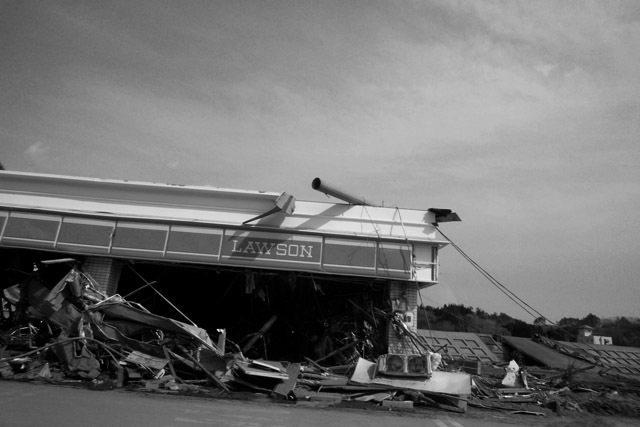 Rubble and debris litter the entire town. I slowly drive along a road that appears to have been just cleared. A large pleasure boat is sitting in the center of town, its hull exposed. Incredible numbers of fishing rods pierce the high hillsides. The location of the sake brewery that I searched for on a map is difficult to approach by car. After circling the town, I find an elementary school that appears to be an evacuation center. I catch sight of self-defense vehicles and equipment at the back of the school yard. It is good to know that some supplies have already made their way here. It is also rather a relief to know that the comparatively insignificant things I have packed into this regular passenger car will suffice as “the little things”. I park the car in the school yard and am approached by a man in uniform. This man, in response to another man that he knows nothing about other than that he has come via Haneda and Aomori and is mumbling something like, “I am sure you will find something of use here, so I hope that you will accept this these supplies,” appears slightly surprised, but grateful and graciously accepts. He calls over several men dressed in the same uniform and others who appear to be government employees, and they accept everything with truly heartfelt gratitude. As I am leaving, the man asks, “Why did you come all the way to this shelter?”, so I explain that there was a particular sake I like to drink, and that the brewery happens to be located in Miyako. I realize that it is an odd reason when he says, “The owner is at this shelter! I’ll go get him!” I am stunned at the coincidence given there is a good distance between the elementary school and the shelter, but I reply, “Oh, no, please don’t bother. I am sure I will return here someday. Please give him my regards,” and drive out of the school grounds that overlook the debris-covered town. is what suddenly occurs to me as I am driving back. There has to be a thousand other ways I can contribute to the relief effort. This epiphany was probably due in part to my kind of pathetic reason for coming out to Miyako. I cannot find accommodations along the Iwate coastline, so I drive inland toward Morioka. Somewhere in the mountains, almost completely devoid of electricity, I stop the car and look up at the Tohoku sky and the protracted winter stars, and I am surprised by how exquisite they are compared to the stars I had seen off Hawaii’s coast that, up until this moment, had been the most beautiful I had ever seen. It has been six years. Compared to then, it is safe to say that the towns have greatly recovered. 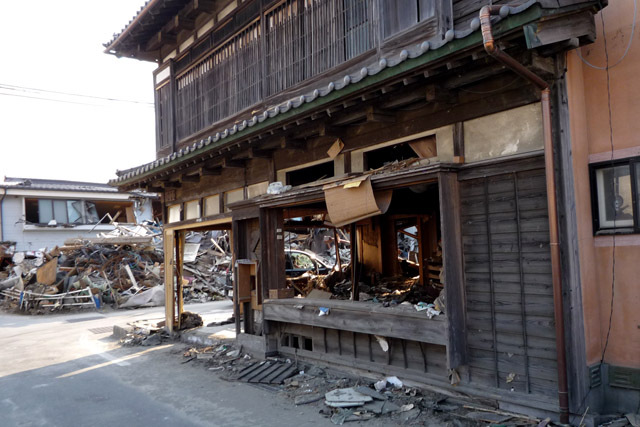 However, if you were to go to the Tohoku region today, you would still find places that have not recovered at all, and that are still faced with endless issues. There does not even seem to be the prospect of reconstruction. Hearts with no hopes, discussions with no conclusions…. Issues that cannot be understood unless seen first-hand, problems that cannot be seen from Tokyo, there are so many that are yet unresolved. Of course, it is impossible for us to spend our entire days contemplating the Tohoku situation, but I feel that we should always bear in mind that the restoration of the region will take 5, 10 or more years to accomplish. 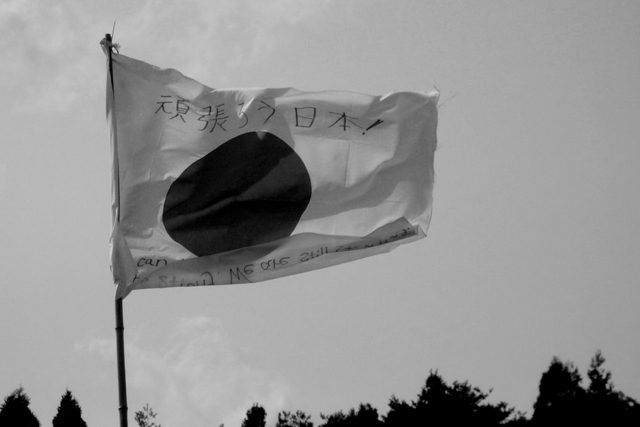 Year after year, particularly on the anniversary of each event, we must take the Tohoku tragedy to heart by looking deep within ourselves and thinking about the problems of the times. April 1, six years ago. That impulse, those emotions. I write these down now so that the memories of the disaster areas that have been burned into my soul never fade into the past. March 12, 2017.